Home cleaning solutions from the store can slowly bite away at your wallet. There are a couple of home cleaning solutions you can make yourself, probably with ingredients you already have, and all you have to purchase is a spray bottle that cost less than a dollar (unless you already have one). Mix: 1 cup white vinegar + 1 cup of water. 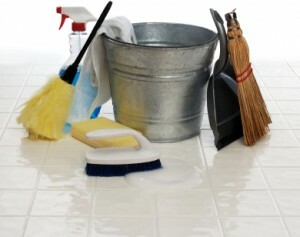 With this mix you can clean bathrooms, counter-tops, floors and other exterior surfaces. If you’re going to use this mixtures for tougher exterior surfaces, like shower walls, you can heat the homemade cleaning solution until it’s a little hot. This will help the solution be more effective in breaking down the residue. This mix can be used for tougher grime and mildew. Apply this paste to an exterior surface and leave it there for 10-15 minutes. This will soften the soap scum and mildew, making it easier for you to wipe away. Another thing you can use baking soda for is slow-running drains. Pour about 1/2 to ¾ of a cup of baking soda into the drain, along with just the right amount of water to wash the solution. After 2 or more hours, flush the drain with hot water. Not only will this clean the drain, but it will also deodorize it! Baking soda is always a miracle worker of sorts, and this is just touching the surface of what baking soda can do.